Abdul B. Kamara’s Unknown Destination and Osman Alimamy Sankoh’s Hybrid Eyes: An African in Europe are two best sellers in the Sierra Leonean Writers Series’ study-abroad literature. The common theme in the two books is a cultural adjustment on college campuses and social challenges in foreign countries. Abdul and Osman both left educational institutions in Sierra Leone to study abroad in Europe and Asia, two of the most common study-abroad destinations for Sierra Leonean students. Key in their decision to study abroad is the possibility to enhance their resumes and become top hires in a global marketplace. As African universities continue to suffer inadequate equipment, facilities, finances, pre-Ph.D. students like Abdul and Osman, with talent and drive for higher education, seek opportunities that can’t be obtained in their country of origin. In this archive photo, Solomon A.J. Pratt (left), I. Taylor-Kamara, and George Coleridge-Taylor (right) look on as Pratt led the debate fighting for China at the United Nations in October 1971. China not to enter the UN but for Taiwan to stay. 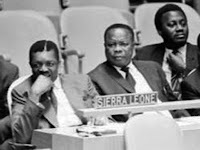 According to the official UN website archives, "America's George Bush failed because Sierra Leone defeated him on behalf of China in 1971." When the Honorable Solomon Pratt paid homage to George Coleridge-Taylor at his funeral in late May 2016, Pratt spoke glowingly of Coleridge-Taylor's role in the United Nations debate that got China's rights restored at the UN. According to Awareness Times, a newspaper founded by Pratt's granddaughter, Sylvia Blyden, the old All People's Congress grandee paid tribute to Coleridge-Taylor for his help in what he called "one of the most famous debates" at the United Nations. On the cover of Joseph Lamin Kamara’s 2016 noir fiction, We’re Not Our Fathers, the lovers in the woods beam up promises of a sweet adventure. “Lahai and Kornyaa have adopted a responsibility of giving each other a love their fathers have refused to give their mothers,” reads the hopeful back blurb of the book. Lahai Jabbie, a bright and sensitive young man, has retreated from heartbreak but hasn’t given up on his lost love. Kornyaa Foray was the girl next door, who only ever wanted to do well, read books, go to college and keep on loving Lahai in Bloom, a shady grove with a guava tree and a log slung over a narrow stream bordered by tulips, sunflowers, and daffodils. There, the reader is transported first to Lahai’s world in rural Koribondo and then to Kornyaa on the gritty streets of tough old Freetown as she struggles to survive with no money, few prospects, and lots of predatory suitors before finally she and Lahai end up together on a bus bound for Pujehun.